Arkham’s past has returned to haunt the city. In The Circle Undone, your team of investigators is tasked with uncovering the truth behind the disappearance of four people from a charity event hosted by the prestigious Silver Twilight Lodge. The vanishing act itself is disturbing, but the more you look into the case, the more impossible the facts become. The evidence points to supernatural forces just beneath the surface of the city’s façade of normalcy: covens of witches, monsters in the mists, shadows in the woods, and all linked to the tangled secrets of a past that Arkham does not wish to acknowledge. Before you meddle with forces you cannot understand, you have to know what you're up against. Today, we're offering you a closer look at the dangers lurking in the mists that cling to the streets of Arkham in The Circle Undone deluxe expansion for Arkham Horror: The Card Game—now available for pre-order at your local retailer or online through our website! The Circle Undone begins by asking you to look to the past with the prologue scenario “Disappearance at the Twilight Estate.” To celebrate Nathaniel Rhodes’s election to the Senate, socialite Josef Meiger of the Silver Twilight Lodge is hosting a charity gala where you and your fellow players will be in attendance, but not as investigators. 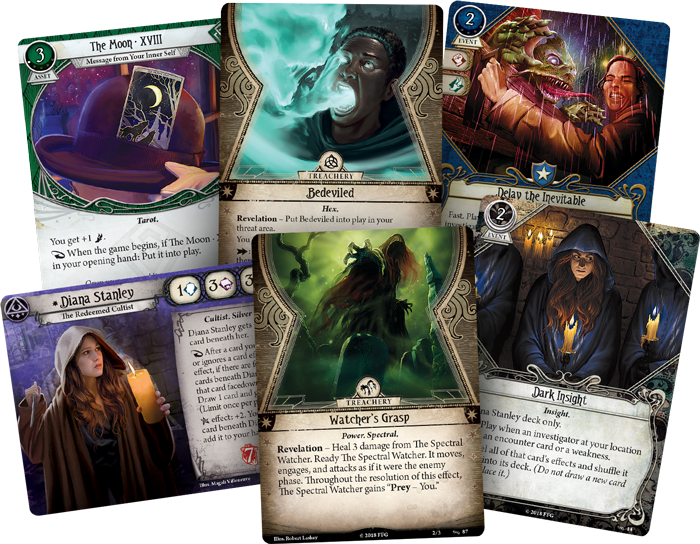 Rather, you embody four other characters, found only in this playable prologue and equipped with nothing more than their neutral investigator card, a few cards that start in play, and their opening hand. The fate of these four souls has already been sealed, but perhaps you can learn from the terrors they witnessed. What did these people see in the Victorian Halls, and what is haunting the city? 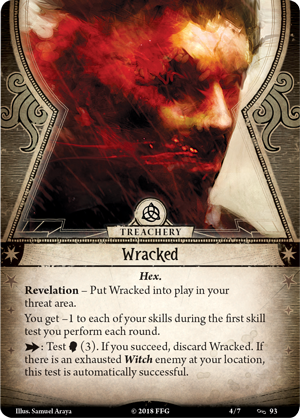 As you are chased through Arkham with witches and impossible creatures at your heels, it may seem like the entire world, even the soulless buildings themselves, are working against you. And in Arkham, you may not be wrong. 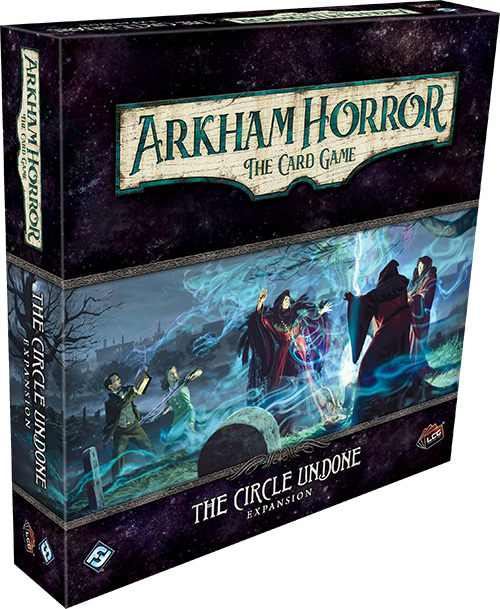 The Circle Undone introduces the new Haunted ability to Arkham Horror: The Card Game. Each time you fail a skill test while investigating a location, you must resolve that location’s Haunted abilities. 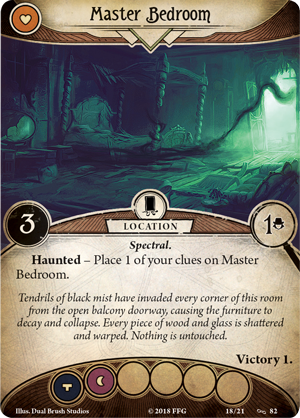 For example, if you attempt to investigate the Master Bedroom (The Circle Undone, 82) and fail, you must instead drop one of your clues at the location. While these haunted locations are treacherous in their own right, The Circle Undone is filled with ghostly creatures that feed off the energy attached to these locations to increase the challenge of your investigation beyond what any mortal should have to bear. 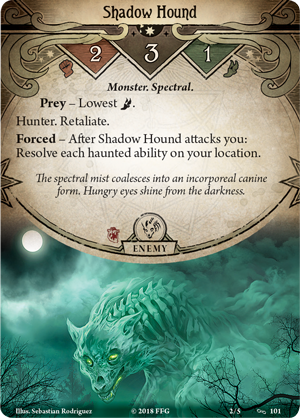 For example, if you are hunted by a Shadow Hound (The Circle Undone, 101), the Spectral beast forces you to resolve each Haunted ability on your location once it attacks you. 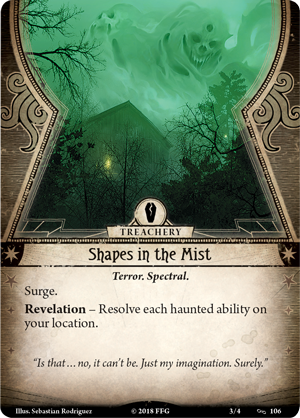 Then, Shapes in the Mist (The Circle Undone, 106) mirrors this effect, forcing you to resolve each Haunted ability on your location, while also drawing you deeper into the terrors of the encounter deck with its surge keyword. Can you hold onto your sanity as you continually face these evils that fade in and out of existence? 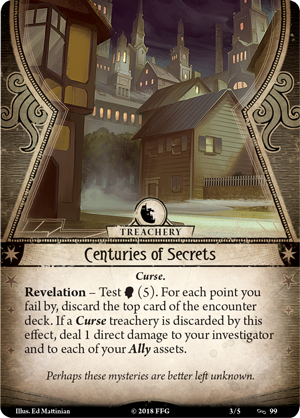 As an investigator in Arkham, maddening mists and spectral terrors may appear little more than everyday challenges, but there are more temporal dangers walking the streets. A new coven of witches has taken up residence in Arkham and they bring with them a new, strange power unlike anything you’ve seen before. Within the ranks of their order, there are sisters of all skills, from the experienced high priestess to the Coven Initiate (The Circle Undone, 90), who must still wait for the stars to align to unlock her full power. 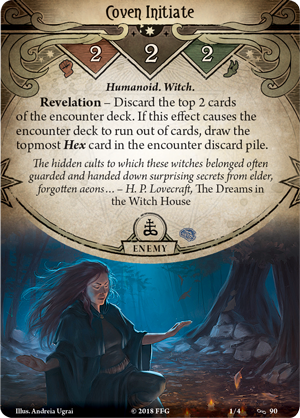 When this Witch is revealed, you must discard the top two cards of the encounter deck, and if this causes the deck to run out of cards, you are afflicted by the topmost Hex in the encounter discard pile! There are plenty of unnatural Hexes to test your skills here. You may become Wracked (The Circle Undone, 93), reducing each of your skills during the first test you perform each round. 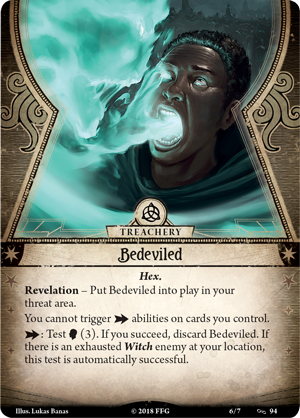 Or, you may be Bedeviled (The Circle Undone, 94), unable to trigger action abilities on your cards. To dispel either of these Hexes, you must successfully test your willpower… or distract the Witch who cursed you by exhausting them. You do not know what these witches are planning or how to stop them, but there have been old stories passed through the generations that may have a hint of truth in them. You must delve into the city’s past in search of answers, but the more you discover, the more dreadful the truth becomes. You may even find yourself questioning whether the city is worth saving. As you uncover Centuries of Secrets (The Circle Undone, 99), you must test your resolve with a mighty willpower test. 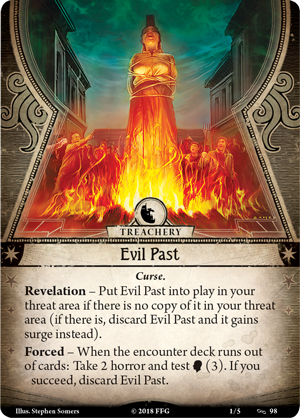 For each point you fail by, you must discard the top card of the encounter deck and, if you should reveal a Curse, you'll take direct damage to your investigator and each of your Allies! Simply put, Arkham’s Evil Past (The Circle Undone, 98) is inescapable. But if you still believe that the city can be redeemed, you cannot surrender the fight. You are Arkham's last hope. No matter how much we may wish it, we cannot outrun the past. And now the mistakes of generations long gone have returned to make the citizens of Arkham pay. Can you save the city from itself? A daunting task stands before you, but perhaps if you can help the city remember its past, you will be able to safeguard its future.